2015-09-03　LPB format(ref. Ver.2.2) has been approved as IEEE Std 2401TM-2015. 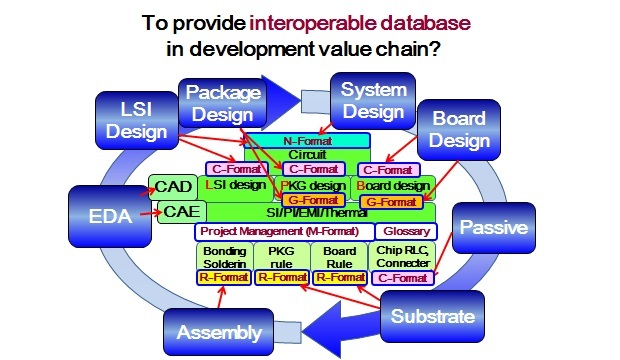 2013-12-31　LPB working group(PJ# 2401) has been established in IEEE Standards Association. 2013-11-3　Special exhibition at EDSFair2013, Panel discussion at SDF2013. LPB stands for LSI Package Board. In order to finish the design quickly for competitive products, the party associated with the LPB should be necessary to work together with the common information. Information required to design of LPB should be prepared in advance, and the design results should be exchanged among LPB. JEITA has set the file and its format for the exchange of information for this purpose. This is the aim of solving problems quickly and reducing the waste of time of the design process in the value chain of suppliers of parts and materials among the design department. 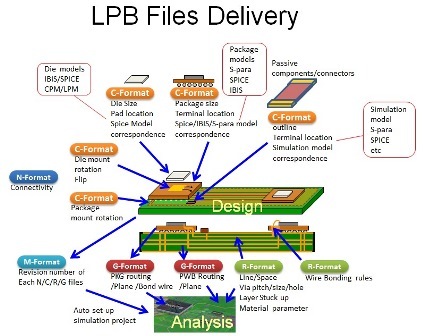 ■Image of LPB files delivery. ■Data sharing in supply chain.